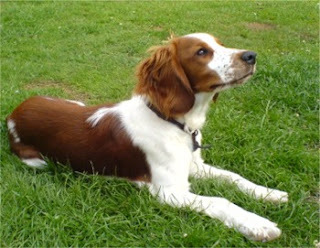 The Welsh springer spaniel was bred in Wales, they are also known as Welshie. They are used for multiple purposes, they are used for hunting, as a guard dog and as a watchdog, because of their multiple uses they are known as a great breed because of their expertise. They have a tendency to hunt in water and in land. These speedy and alert dogs are very loyal to their masters. They are very brave, muscular and have a very nice and soft texture. They do well with children and older people, they adjust well with other small pets and animals. This breed of dogs is very reserved with strangers but is not shy. This breed of dog has a single coat which is straight with a soft texture. The coat is weather proof and provides protection from weather. This breed's coat color only comes in red and white, with many pattern variations. They are average shedders. This breed of dogs is a good learner but can be headstrong. They require early socialization and obedience training. Training should be done with fairness and patience, they will not respond to any hard and harsh methods of training. The Welsh springer spaniel is a highly energetic breed; they require regular exercise to remain fit. They do okay in apartments, if they are provided sufficient exercise. The Welsh springer spaniel needs regular brushing with a stiff bristle brush, bathing should be done when needed. As a pet owner you are responsible for your pet's health, the dog can not verbally communicate its health problems but changes in its behavior will alert you to any diseases that the dog might have. Keep a look out for symptoms of common dog diseases and if you notice anything that seems out of the ordinary consult a veterinary at the earliest for timely treatment. A healthy dog is a happy companion.